Gouverneur des Herzogtums Mailand (um 1515-1571). 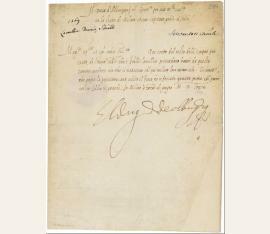 Letter signed ("El Duque de Albuquerque"). Mailand. 1 S. auf Doppelblatt. Mit Adresse und papiergedecktem Siegel. Gr.-4to. 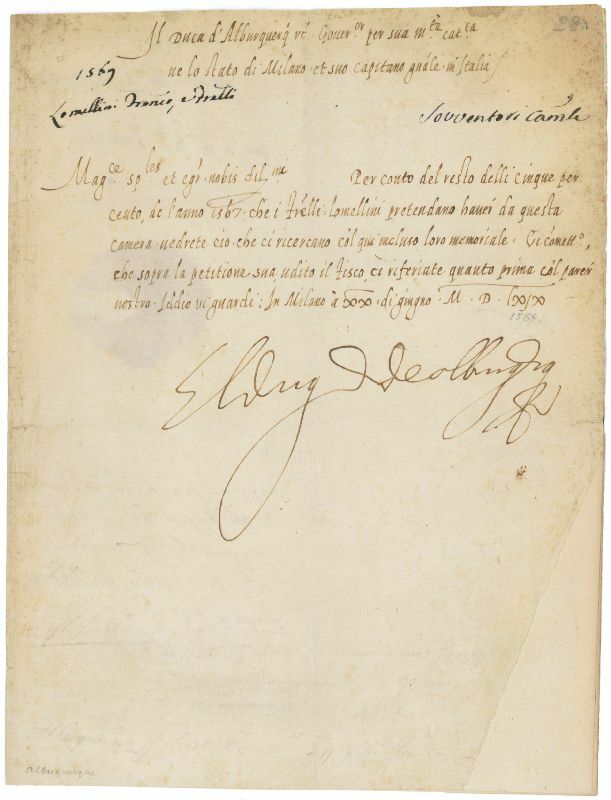 Chancery document by the 5th Duque de Alburquerque, who had served as Viceroy of Navarra between 1560 and 1564, writing as Viceroy of Milan, in matters of revenue, to the fiscal magistrate of Genoa: "Per conto del resto delli cinque per cento, de l'anno 1567, che i fr[at]elli Lomellini pretendano haver da questa camera, vedrete ciò che ricercano col qui incluso loro memoriale. Scomettente che sopra la petitione sua udito il fisco, ci riferiate quanto prima col parer nostro. Iddio vi guardi [...]". - Traces of folds; slight brownstaining to margin; two edge defects restored professionally.